Fresh Roasting: All of our nut varieties are all freshly roasted and glazed on location. Depending our your target market you can use various nut varieties. In Hawaii, they fresh roast and glaze the macadamias which is their niche. Quality: We take pride in the quality of the nuts direct and fresh from the growers. Along with simple ingredients; Cinnamon, sugar, and vanilla, all the aromas that will draw the customers to your business. Machinery: Our "Mandelprofi" nut roasting machines are the best and most-reliable on the market world-wide. The machine produces a 5# batch in about 8-10 minutes. Simple operation: The nut roasting machine is simple to operate and with the glazing mix already pre-packaged it's not only convenient but cost effective. Advertising: Not many companies can say that they have built-in advertising. With our fresh-roasting on site as soon as we start to fresh-roast people start to follow their noses! Family-Friendly Model: Totally Nutz is a family-friendly franchise. The franchise allows families to work at a variety of events and venues, in a fun and exciting atmosphere. Not only do Mom and Dad get to generate some serious income, they get to teach their children the value of an honest days work! 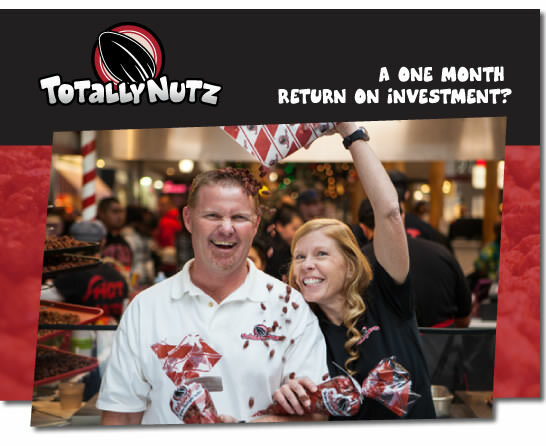 Vacation Can Be The Norm: Totally Nutz allows Franchisees the opportunity to earn an entire years income over a period of just a few months. This allows our Owners more time to enjoy their lives, and their families. 5 days of initial training at the St. George training facility. Additional on-site training is optional with additional cost. Totally Nutz is currently accepting inquiries for all states except Utah. Totally Nutz is currently accepting inquiries from the following states: Wyoming, West Virginia, Wisconsin, Washington, Vermont, Virginia, Texas, Tennessee, South Dakota, South Carolina, Rhode Island, Pennsylvania, Oregon, Oklahoma, Ohio, New York, Nevada, New Mexico, New Jersey, New Hampshire, Nebraska, North Dakota, North Carolina, Montana, Mississippi, Missouri, Minnesota, Michigan, Maine, Maryland, Massachusetts, Louisiana, Kentucky, Kansas, Indiana, Illinois, Idaho, Iowa, Hawaii, Georgia, Florida, Delaware, Washington, D.C., Connecticut, Colorado, California, Arizona, Arkansas, Alabama, Alaska.